Set in World War II, Desmond Doss (Andrew Garfield) enlists as a medic in the Army. Unlike the rest of the soldiers, and due to his own religious practices, Desmond refuses to use a weapon in battle, making him a conscientious objector. He faces a lot of opposition to his decision, but enters the battle ground unarmed, putting his own life at risk. Mel Gibson has sparked much controversy in recent years, but has been directing on and off for 20 years now, long enough to have received an Academy Award. His previously acclaimed war film, Braveheart, won “Best Picture” in 1995. This year, Gibson makes a fierce comeback with the genre he knows so well. While the vast majority of war films intend to glorify the battle, Hacksaw Ridge boasts a contrasting ideology. Here, the amount of lives saved is focused upon, rather than the lives lost. Gibson’s work surpasses the concept of ‘limitations’ – instead, presented is a barbaric display of violence and carnage. Imagine extended cuts of Saving Private Ryan’s opening scene, though twice as powerful and spine-chillingly graphic. One would assume they are occupied with raw footage from the war, not a piece of contemporary film. The first act steers clear of the bloodshed, but when approaching the ridge, the scenes become distressing, and make for a difficult watch.The most telling scenes, set on the battle ground, are staged in the most brutal, yet effective manner. It must be emphasised, this cinematic experience is not for the faint-hearted. Andrew Garfield gives an award-worthy performance, matchless to the rest of his career, as Desmond Doss. He conveys the heroic status of the protagonist with such ease. The entire cast comes together to create an effective ensemble. Even Vince Vaughn, Doss’s sergeant, exudes humour in the darkest of scenes. Shredded flesh, bullet stricken corpses and the ringing sound of gunshots fill each scene with sheer dread. The harsh realities of war are inescapable in this moving motion picture. 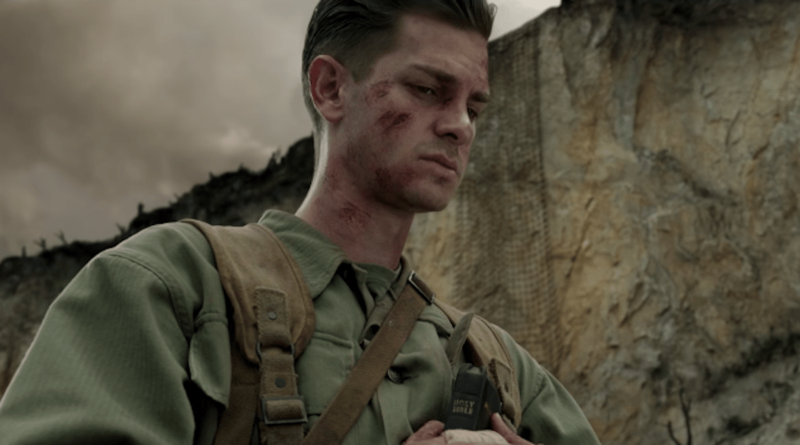 Expect to cry yourself a river from the intensity of the battle scenes in Hacksaw Ridge. Gibson has done an impeccable and respectful job. Utterly inspiring, and not preachy in the slightest. You will feel overwhelmed by the harrowing impact, or simply struggling in attempt to combat it. This is definitely one of the best war films that I’ve seen! Gibson knows how to direct brutal action. Great review! Me too, Brett! Definitely one of the best films of the year too. I think too many critics focused on Gibson’s personal life/controversy, and influenced their thoughts a lot. It’s important to remember those controversies, but it’s also important to separate the art from the artist. It’s hard to deny that he does stellar work here. I can’t wait to see your Top 10 list!! This is the type of movie I can appreciate without wanting to see it. Crap, your review has convinced me to get over Garfield’s accent and give this movie a shot. Great review! Ha ha! Thank You. Really hope you enjoy it! !